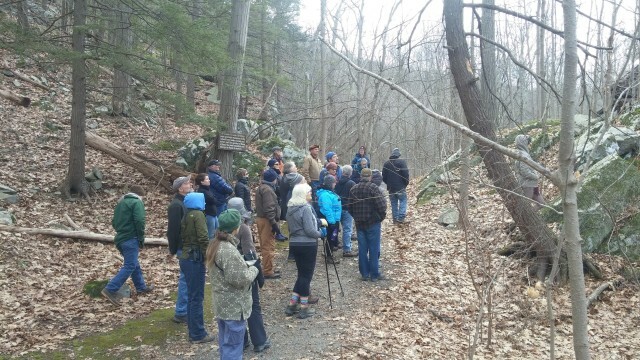 The first in a series of outings co-sponsored with the John Burroughs Association at the wonderful Burroughs Sanctuary. After two hours spent identifying trees by bark,structure, and bud on the improved trail system (rated as easy to moderate) along the trail to Chodikee Lake participants can explore Slabsides and learm more about the interesting life of our famous namesake. Contact trip leader Tom O’Dowd (tkodowd@gmail.com or 914 213-7079) with any questions regarding the tree walk and meet Tom at Pond House. Follow the “Path through History” signs at the interesection of Floyd Ackert Road and Rt. 9W in West Park and turn west onto Floyd Ackert Road (at Global Palate restaurant) and continue for nearly a mile, then take first left AFTER Burroughs Drive. NOTE THE NEW MEETING PLACE FOR THIS FIELD TRIP.